The author, Ben Woodard, gave me a copy of this novel in exchange for my review. Steps Into Darkness (A Shakertown Adventure) brings up an interesting debate raging currently in the literary world. Should racism and slurs be removed from novels? In Steps Into Darkness (A Shakertown Adventure), it’s 1923 and we’re in small-town Kentucky. They’ve had an influx of workers with a different skin tone from what one might usually see on the street as the building of the Dix Dam is a huge project. Racism anywhere in 1923 was a fact of life, but especially in very small-town rural areas where people with visible differences were few and far between. Should a work be homogenized or things glossed over to fit with modern mores when its set in 1923? We’ve heard the arguments about certain words being removed from works of a bygone era (The Adventures of Tom Sawyer (Dover Thrift Editions) springs to mind) but should modern authors writing of the past avoid hot button racial issues? I think not. It is important for our children to know how cruel the world was so that they will be conscious in their dealings today how far we’ve come and more importantly that inside we’re all the same. In a world where we see people like Aaryn Gries and Gina Marie Zimmerman on Big Brother 15 tossing slurs, kids need to learn that once there was ugliness and it’s sad and horrible but now we know better and we should treat anyone of any color how we’d want to be treated. These historic works don’t glorify the oppressors. They’re presented as a fact of what walking through the streets of small town Kentucky was in those days. As with any novel, I think that this is a work that you talk to your children about both before and after they read. And if nothing else can be said about Woodard’s work, we can say that he has small-town Kentucky down. He writes his settling as vividly accurate and I found the description of the building of the dam fascinating. If you haven’t been to the Dix Dam in Garrard, Kentucky, I urge you to pull up the Google Maps. It is a beautiful dam and the complexity of the engineering and the magnitude of what could go wrong are portrayed with a sense of great urgency which, as with the first, hastens the pace of the novel. As the boys get closer to a solution they put themselves more firmly in danger and set with the backdrop of such a project and how this is a save it sort of moment, the readers will cheer for Tom and Will to save the day. Boys and girls will be sucked into the story and perhaps want to learn more about the history of such complex works that seemed not so long before not within the human grasp. Steps Into Darkness (A Shakertown Adventure) is an action packed period piece. The characters of Tom and Will develop in this second novel of the series. Tom is eager to move on and Will is equally eager to keep him at his side. That boys of 14 would be thinking of striking out on their own speaks to the era where a boy left on his own didn’t want to be a burden to anyone. Woodard allows his female characters to take an active role while acknowledging that it’s not something of which society would approve. All of his teen characters have pluck and realism and are active participants in the story. Steps Into Darkness (A Shakertown Adventure) is a new novel with a classic feel. If your kids like mysteries in the spirit of Huckleberry Finn meets Encyclopedia Brown, they’ll love the Shakertown Series. If you’re an adult who likes young adult novels, give this series a shot. Ben Woodard is a Kentucky author who has traveled extensively. As a child he loved to real mystery. 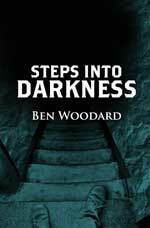 Steps Into Darkness (A Shakertown Adventure) is his third novel. His other novels are The Boy Who Flew With Eagles and A Stairway To Danger (A Shakertown Adventure) (you can see my review of that novel by clicking here). He also has a novella that serves as a companion to the Shakertown series called The Trestle. For more information about Ben Woodard, visit his website. You can connect with him on Goodreads, Facebook and Twitter @benswoodard. Thank you Tammy. I’m glad you liked my inclusion of the racism of the twenties in the book. I agonized over how much to say about it. I did a ton of research, but much of what I wrote about came from what I saw growing up in the fifties. Not much changed over the years. But I wanted to temper realism with a larger than life adventure and with humor. I’m glad you liked the book. You’re so right, Jeff. We dishonor what they suffered by hiding the horror in the reality of the cruelty of the time.